X planes seem to be an in-thing. Several manufacturers recently issued a rash of 1/72 releases centered on the earliest days of supersonic probing. The Bell X-2, in addition to being resin-poured by Alliance and Anigrand, has been injected by Mach 2, a French semi-short run company of deservedly ill repute; and Golden Age, a new kid on the block belonging to the Olimp consortium. A long string of difficult US ‘tweener biplane builds had resulted in a case of Yellow (wing) Fever, otherwise known as boredom with the same old subject; so I decided to add a few of these sleek additions to my Experimentals Collection. Unfortunately, the Golden Age kit, though previewed on several modeling sites, was nowhere to be purchased. I had previously struggled with several Mach 2 short runs, still had a few in the stash waiting for better versions, and should have known better. 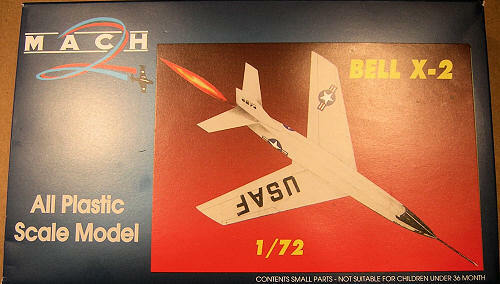 I didn’t; and shelled out an astonishing, for cheapskate me, $70+ for Mach2’s X-2 and Douglas D-558 Skyrocket. According to Wikipedia, the World’s Most Convenient if not Accurate Authority on Everything, the Bell X-2 was conceived to examine problems with control, stability, and frictional heat expected at speeds approaching three times the speed of sound. The X-2 became the first airplane to reach, then exceed, Mach 3; and also to fly above 100,000 feet, making it up to 126+K. High speed stability and control were indeed shortcomings of the X-2, and it killed two pilots. The program was cancelled before answering most of the questions. The kit comes boxed in a colorful, sturdy, stapled, top-opening carton with a corrugated bottom half that serves as a convenient parts tray. That’s the high point, Folks. From there it veritably avalanches down hill. 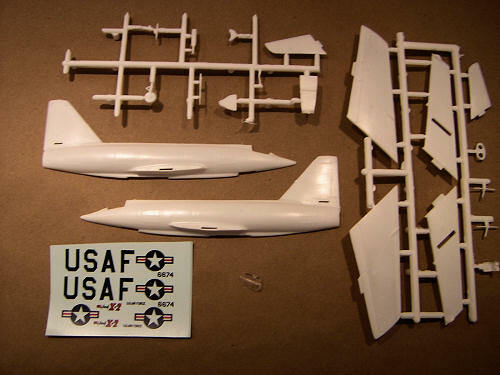 Two sprues of white plastic, one semi-clear injected canopy, a sheet of decent-looking decals, and an instruction sheet that shows only the barest essentials that might not be otherwise deduceable by the average IQ. What did you expect for $37 – resin and PEB? The parts breakdown is very simple. Flash isn’t too great a problem, except on small parts such as landing gear, which are more easily scratch built than cleaned up. 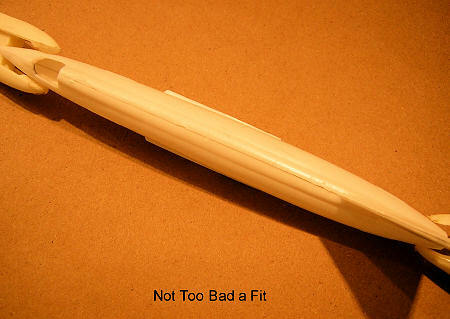 Fit of the fuselage and wing halves is acceptable. A few swipes against a sheet of 220 grit and only minimal clamping is needed. Sink holes, flaws, surface roughness – those are other matters; but no issue can overshadow the problems caused by the waxy, low-pressure plastic. One more should be added: DON’T stomp it, because these injunctions aren’t as absolute as they sound. Building a Mach 2 kit is possible, but the normal techniques need to be amended. On the subject of clipping, the sprue gates on these kits are by short run standards not large, but they are intrusive and extend into the part. Even with a high priced cutter, clipping, snipping, and nipping of any sort will get you an irreparable divot whacked out of a leading edge. Sawing and gnawing will do worse. The only safe tool is a fresh double edged Gillette or Wilkenson’s razor blade carefully slid outward along the slant of the camber. Even then. Leave some excess for careful finishing. Gluing Mach 2 plastic is similarly touchy. Once the waxy stuff gets into its nostrils a whiff of toluene, acetone, of methyl-ethyl keytone it transforms itself into a fifth state of matter, somewhere between liquid and solid; about the consistency I recall to be the ground back up in Vermont during those early April weeks we un-fondly referred to as “Mud Season”. New England mud, however, eventually solidified. Mach 2 plastic never will. Fuselage halves are the only seams suitable for solvent welding. For wings, tailplanes, and all other appurtenances use cyano-acrylate. For similar reasons of solubility, fillers such as Bondo and Green stuff do not work. Even if the plastic would dry without shrinking, which on either count it will not do, the disparity in hardness would make improbable an invisible, feathered seam. Sanding, filing, grinding, and polishing are also nearly impossible. The stuff seems to either melt or crumble under the lightest strokes. 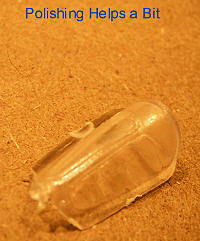 The best tool for removing semi hardened ooze from joints is actually a fingernail. Once the grossest and most offending protuberances are excised, do nothing before coating the airframe with automotive sandable primer. Careful with the wetness of the coat; remember what I said about solvents. 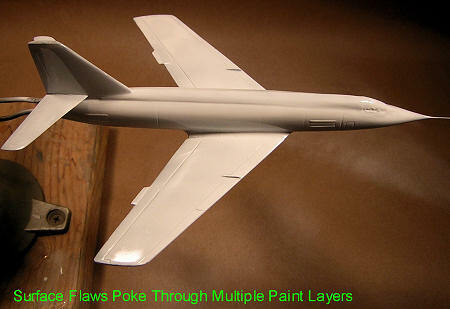 Consider the model merely a skeleton on which to hang primer and paint. Do all the surface prep on those layers, avoiding abrasion down to the pathetic bedrock. The proscription against drying refers to heat. Do not subject a Mach 2 kit, particularly one that has been treated to solvent glues, to any source of radiant or conductive thermal energy exceeding the surface temperature of Neptune. Following its pre-paint bath, my X-2 was treated to the usual blow-dry provided by a hair dryer set on “low” and sitting about a yard away. After a half hour I returned to find the wings and tailplanes drooping near vertical and contorted into sine curves. I was able to bend things back into a shape that was preserved by immersing in ice water. My mental shape was preserved by immersion in ethanol. Not much in this department that hasn’t already been said. Before mating the fuselage halves put plenty of lead or depleted uranium in the nose. A cockpit floor and rear bulkhead are provided along with a barely recognizable ejection seat for those who would like to display the flight deck open. I included the floor only as a mounting point for the nose wheel, and a more shapely seat because you can actually see through those tiny windows and the emptiness would be evident. The cockpit hood is all transparent, or rather translucent, so the windows have to be masked. Mach 2’s clear parts are actually amenable to polishing. I got some improvement by buffing with Johnson’s Scratch Out auto polish. Keep the Dremel tool working slowly and in short bursts to avoid melting. 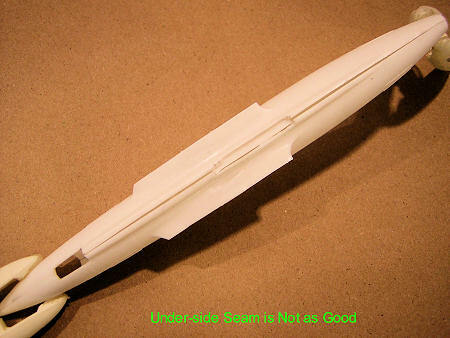 The wing parts are thankfully and perhaps thoughtfull y molded with the leading and trailing edges attached to the upper half; but lots of tweaking is necessary to get a decent airfoil. 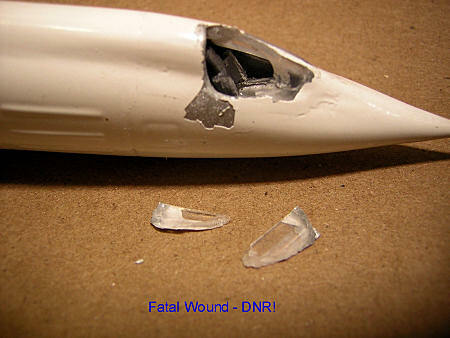 I replaced the plastic pitot probe with a quilter’s pin and formed a nosecone transition out of gel acrylate. 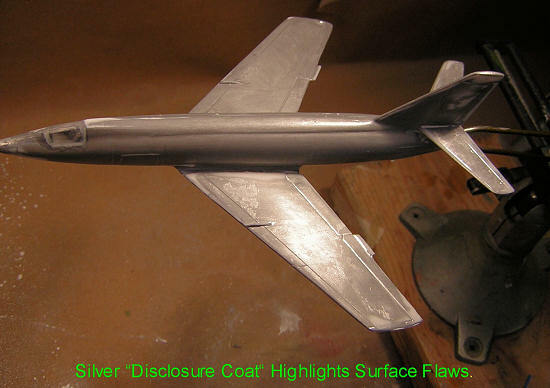 Before learning how difficult it is to get a decent surface, I primed with bright silver to reveal all the faults. I ended up sanding and re-spraying about a half dozen times before giving up and encasing the plane in auto primer. 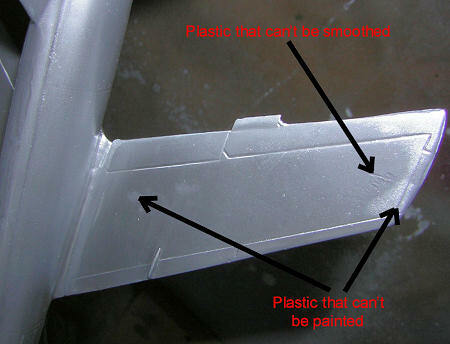 A Mach 2 kit is not the substrate on which to attempt a flawless finish. Good enough has to be good enough. I visually softened all boogers with several heavy coats of Testors square bottle white, diluted only enough to get it through the airbrush tip at high pressure. After several days of drying, those infernal unpaintable areas had bled through all 17 coats and caused wrinkled areas. Sanding and repainting would have accomplished nothing so I just left them. With so many shortcomings in a kit, one might hope that at least the decals would be trouble free; but no such luck. On the sheet they look promising with no hint of a carrier film surround. That’s because the carrier film covers the entire sheet and each marking must be individually trimmed, a process not worth the effort because they are so thick and otherwise unworkable. I managed to find reasonable replacements in the spares box - but never got the opportunity to apply them. No, that’s not a typographical error or a quip. It’s DESTRUCTION; not Final CONstuction. This is a first in Modeling Madness history – the first ever full build review of a kit that never got fully built. No, I did not out of frustration stomp it into oblivion. Perhaps the Almighty did that to spare me additional angst. While the airframe was stuck in a Panavise waiting for its semi-final coat of touched-up white enamel to dry, it took a tumble off the bench, landing on the canopy noggin that I had spent so many hours carefully sanding and fairing in with the fuselage. The plastic that I had condemned as soft and waxy somehow shattered into shards, the likes of which I had not seen since my days of stuffing firecrackers into just-completed planes. Notions of heroic revival efforts tumbled through my brain. I could glue the pieces together, form a female mold with Alumite, slosh-cast a replacement hood with clear epoxy or a solid form on which to vac one. Cutting away the old remnants would be touchy; and blending in the repair would take many hours of intricate sanding. My wife, who over the previous week of dinners had heard my laments about the kit, and who on so many occasions had offered sage but unheeded advice, reminded me of a guiding principle we had learned in EMT class: When the victim’s death is unquestionable – DNR – Do Not Resuscitate! The Bell X-2 was a beautiful airplane. Mach 2’s $30+ rendering does it no justice. With alternatives available, some less expensive, no point is served in devoting all the effort striving for a silk purse. If resin is not your medium of choice, do as I am now doing. Hunt up the Olimp/Golden Age injected version. And Enjoy. Editor's Note: Not wanting to Whizz in Greg's Wheaties, but the Olimp kit isn't a basket full of strawberries either. It is nearly as demanding as the Mach 2 kit, which is why I've not finished it......yet.